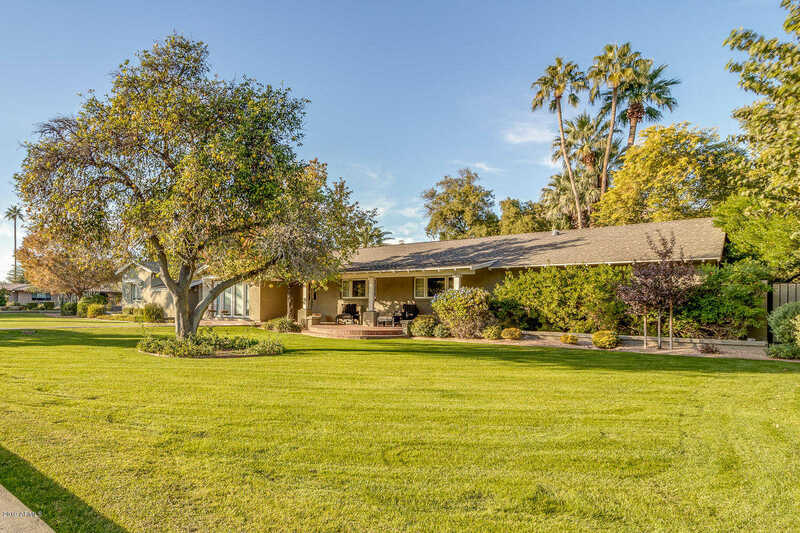 This five bedroom plus office, four bath spacious family home sits on a quiet 1/2 acre corner lot in one of the most desirable pockets of Arcadia! An extensive remodel was done in 2004 by Candelaria Design, and landscaping by the Berghoff Design Group. This home features a large backyard with a sparkling pool, spa, built-in BBQ, two fireplaces, mature trees, and large patios. The warm, bright, and open floor plan is incredibly charming and features vaulted ceilings, Plantation shutters, hardwood floors, with surround sound. The kitchen features granite countertops and stainless appliances and opens to the family room with high ceilings and mountain views. This home has been immaculately cared for, one you do not want to miss! Directions: South on 58th St. from Exeter, Left(E) on Calle Del Media. Home is on the North East Corner of Calle Del Media and 58th St. Approximate size: 23923.00 sq. ft. Please, send me more information on this property: MLS# 5868420 – $1,630,000 – 5802 E Calle Del Media --, Phoenix, AZ 85018. I would like to schedule a private showing for this property: MLS# 5868420 – $1,630,000 – 5802 E Calle Del Media --, Phoenix, AZ 85018.